A super quick easy - peasy post today. Remember last month I set myself a little Pinterest Challenge? I have to admit I struggled to find re-coverable buttons so luckily I had a few in my button box. Measure the fabric against the button and make sure you leave enough to tuck in the back. Now I really need to find more buttons so I can make more. 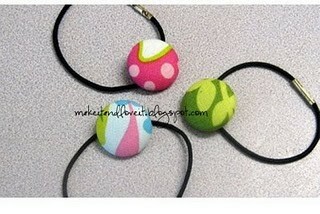 They are so easy and simple and a great pick me up for a plain hair tie. Wonderful and creative hair bows! I found you through your excellent comment on Thistlewood Farms and just had to come over and check out your blog! Found you from the thread at Thistlewood Farm. THIS IS THE MOST CLEVER IDEA! I love this - and have 3 young nieces, we are sooooo going to do this as a project next time they come over. Thanks for the great idea, well done, ma'am!! Have a wonderful holiday weekend coming up! Natalie, Great idea! These are so cute and a nice change from traditional hair bows. I wish you and your family a Happy Easter!